Letter to Martha Berry from Charles H. Zehnder offering a donation of $25.00 to the schools to help replace the burned dormitory. 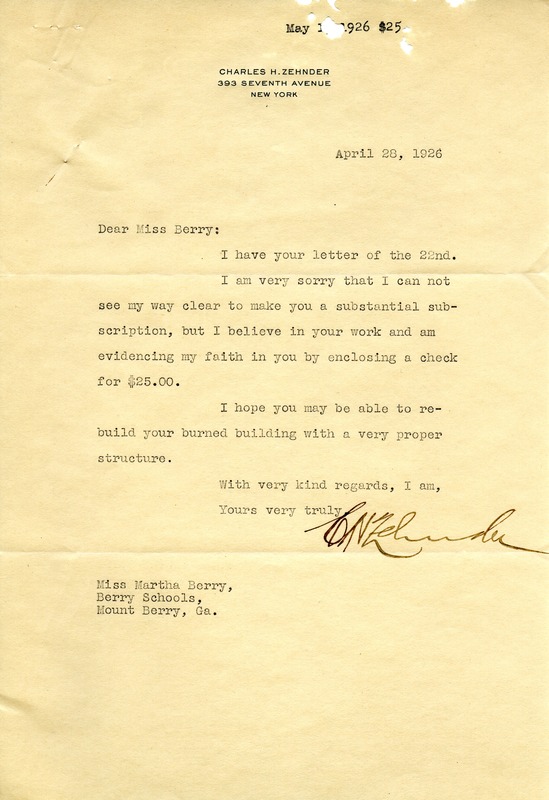 Charles H. Zehnder, “Letter to Martha Berry from Charles H. Zehnder.” Martha Berry Digital Archive. Eds. Schlitz, Stephanie A., Chelsea Risley, Haley Fortune , et al. Mount Berry: Berry College, 2012. accessed April 25, 2019, https://mbda.berry.edu/items/show/3829.